This is the Mel Bay Complete Clawhammer Book, co-authored by my teacher Lisa Schmitz and Alec Slater. It has many Irish tunes and Old Time fiddle tunes. Seems the longer I play the more I go back and find new songs from this book. The tab is very clear and the versions are very playable. 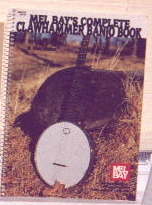 This is Ken Perlman's Melodic Clawhammer Banjo book, published by Oak Publications. It has over 50 tunes in clear tablature, including Appalachian fiddle tunes, string-band tunes, New England hornpipes, Irish jigs, reels and more...This book is not for the beginner. I really enjoy Ken's style and try to play a lot of his versions of songs. Melodic Clawhammer is very notey stuff and requires a lot of triplets and off-string pull-offs, but sounds very nice when it is done well. 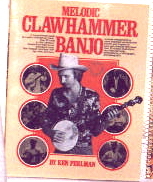 This is Ken Perlman's "Clawhammer Style Banjo" book. This is the book that I went through from cover to cover. It is a very comprehensive look at the many types of styles that make up Clawhammer banjo playing. It also is a very good instructional manual for the beginning banjo player. It walks you through the basics and incorporates what you have learned in exercises and songs. The more techniques you learn, the more complex the songs become. What I really like is the building of a song that he uses throughout the book. With each new version of a song, he adds what you have just worked on in the previous exercise. This allows you to take a song familiar to you and put in further embellishments.For me, this is the definitive book to learn how to play Clawhammer banjo. This book is put out by Centerstream @$15.95. A video of all of the songs is also available. This is "The Banjo Player's Songbook," by Tim Jumper. It is published by Oak Publications and costs $20-25. It has over 200 songs in it such as folk songs, sentimental favorites, songs of the sea, fiddle tunes, Christmas songs and more. It is a very good reference book for the beginning Clawhammer player. It has many easily recognizable tunes tabbed out in a manner where almost every level of competence can play them. These are really the "bare bones" versions of the songs, but you can always doctor them up to your own liking. I think this book is also a must have for the fledgling frailing enthusiast. This is Bob Carlin's, "Fiddle Tunes For Clawhammer Banjo. "It has over 30 fiddle tunes in this book. I never have given the book much of a chance. It has some odd tunings and just seemed too difficult when I first started to play. I guess it is about time I give it another look. He is a very good melodic Clawhammer player. Published by Centerstream @ $7.95. This is "The Art Of The Mountain Banjo," by Art Rosenbaum. It is published by Centerstream and cost $11.95. This is another one of those books, that I found beyond me at first. I think all of the pictures and graphics detracts from the readability of the tab. Plus, a lot of it is spread out over two or 3 pages and just seems badly formatted. In addition the book has 2 & 3 finger picking included. This may add to your liking of the book or make you feel that you didn't receive a good value for your dollar. Most people just don't play 3 different styles.